Michael Sparks Keegan - Photographer: Johnny A. and his "Sweet 16." 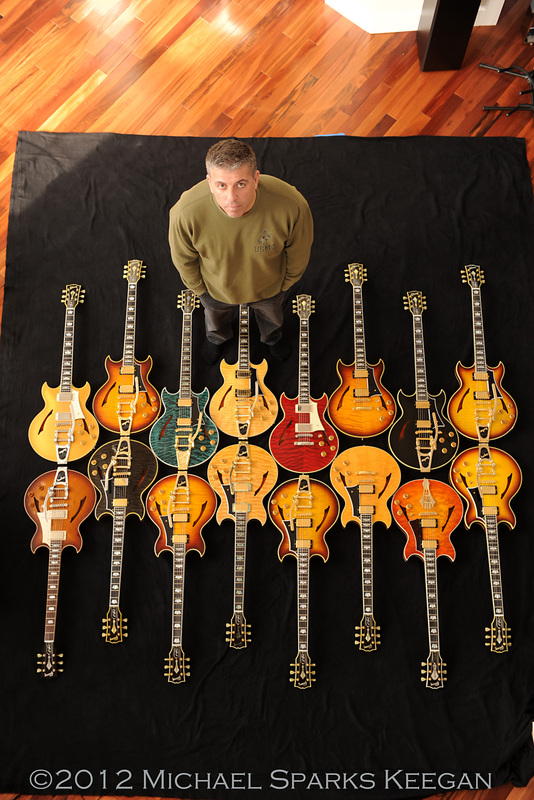 Johnny A. and his "Sweet 16." 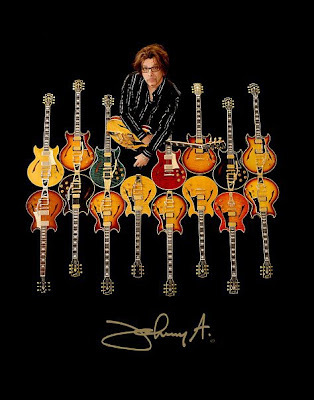 Recently, I re-posted a photograph that I shot for Johnny A. of him posing with his sixteen signature Gibson guitars. The shot eventually was turned into a poster and another version became the front of a t-shirt. 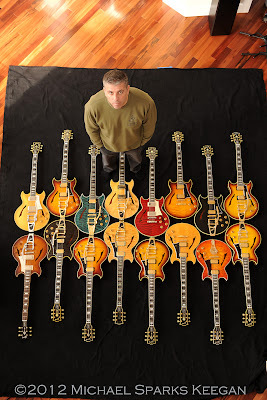 The one of JA and his guitars is still one of my all-time favorite photographs. When I re-posted the picture several people (photographers, mostly) wanted to know how much photoshop was done to the shot. Most are surprised when I say that there was hardly any and what you see is almost completely done in the camera. The black background was cleaned up a bit because it was was a bit dusty from being in the truck but otherwise what you see is what was shot. 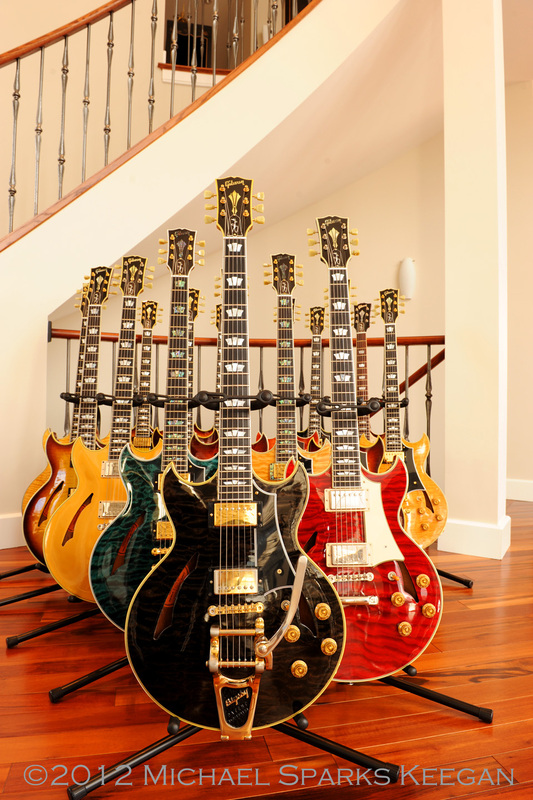 When I got to his house there were 16 guitars in 16 stands lined up like bowling pins waiting to be shot. Not a bad look, but not the kind of thing that will get people's attention when they are lined up at a merch table. 16 beautiful models ready and waiting. (I tend to bring too much stuff to a gig and sometimes it pays off). 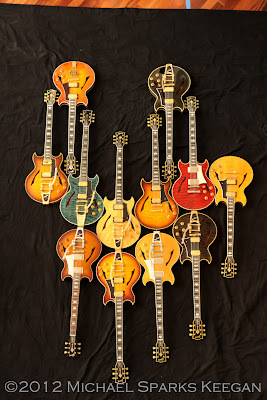 patterns of how the guitars should look. It took a few tries but we finally came up with a layout that looked good. Right colors next to the right colors, right models next to the right models. Things just started to come together and all we had to do now was get JA ready for his close up. Before he returned I asked Rick to stand in for him and did a quick test of the shot with him in the position that I would have Johnny in. Everything looked good so we were ready to try it for real. Sometimes changing things on the fly, scrapping one idea completely and going to another works out really well. The more I push to make things happen when I am not feeling it can lead to a shot that I am not happy with. This was one of those times when going with the feeling, walking away from the first idea and trusting how things were going paid off better than trying to force the original shot. Johnny was ready and stepped in to his spot as I returned to the balcony upstairs. Oh, did I forget to mention that all the shots were taken from a balcony about 15 feet or so over JA's head? I am pretty much hanging as far as I can over the rail of the balcony while holding several pounds of camera and lens. 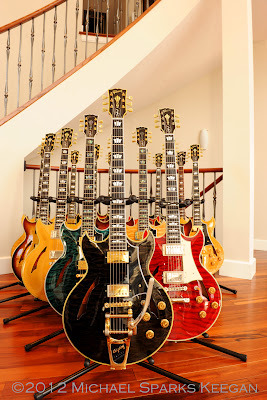 and trying to compose and focus while doing everything I can not to fall over the rail or drop something heavy and metal on Johnny or tens of thousands of dollars worth of guitars. It was one of those times that I have to pay total attention to the job at hand or I would be the proud owner of a slightly crushe guitar or trying to find an ice pack and aspirin for two. Neither option sounded attractive so I watched my step. Carefully. As usual, JA rocked and had the pose down and I balanced and shot and got what we wanted without any damage done or calls to 911. Always a good thing. The hardest part of the whole shoot was that we left for Hawaii a couple of days later for a few weeks and so we had to do all the proofing, selecting and prep for printing from the North Shore of Oahu in order to make the deadline. We had so many calls and emails back and forth it felt like JA had become part of the family and had made the trip with us. So thats the Readers Digest version of that shot and it is still one of my favorite photographs which is saying something when you look at its competition. What a great summary, thanks for sharing with us! We shoot lots of portraits using a black velvet backdrop and it really makes the subject 'pop'. Love your work, and love ya Johnny A! Michael, you never cease to amaze me! Both you and JA ROCK!! Keep shooting, and we'll keep watching for your amazing work!